How lovely is this Rupert Bear annual? Now take a closer look at the attentive, plucky wee fellow on the right - is he not the cutest little red you ever did see? To be honest, I was never a great fan when I was little - Rupert was alright and even as a child I appreciated the beautiful annuals [although nothing would ever match my beloved and unashamedly girly Twinkle books] but there wasn't much humour in the stories as there was with say Winnie the Pooh and Paddington Bear and he did have some really wierd friends like that hideous little twiggy thing that must surely still be the stuff of night mares to any child? I refuse to even post a picture of it here to illustrate my point - look it up and you'll see. 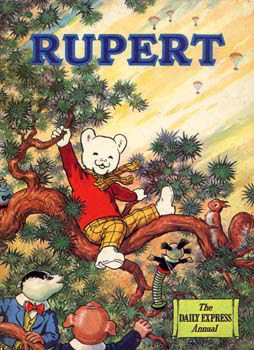 Rupert was originally created as a comic strip for the Daily Express during the 1920s by Mary Tourtel but when she retired the artist Alfred Bestall took over and he is responsible for these delightful annual covers. He tended to put the same characters on the covers so this squirrel shows up quite a bit. There's a heart felt homage to Rupert here on Brian Sibley’s blog that also contains a link to a Chris Beetles’ sale in November last year that contained some of Bestall's works along with all manner of other gorgeous illustrations [The Illustrators 1837-2011].